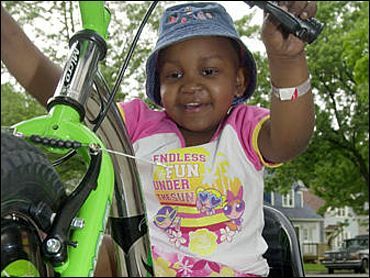 Four-year-old Domonique Patton was a weekend away from having her leg amputated — the only solution, her surgeon insisted, for bone cancer in someone so young. Then her mother found a leg-saving alternative: the first bone-replacing implant that doesn't require more surgery to lengthen as a child's other leg grows. Leitia Patton checked her daughter out of the hospital and drove from Michigan to Chicago hunting a surgeon willing to try the new technology. Then engineers raced to custom-make the "growable" metal rod to fit Domonique — their youngest patient yet — in the week doctors were able to postpone removing her tumor. Now two months after surgery, Domonique walks like any preschooler, a narrow scar by her knee the main sign of the struggle to save her leg and her life. The implant, called Repiphysis, marks a huge advance for children with bone cancer, says Dr. Steven Gitelis, the orthopedic oncologist who operated on Domonique. As the child grows, doctors simply beam painless electromagnetic rays that make the rod slowly expand, instead of repeatedly cutting into the leg — as other limb-lengthening devices require. "There's more enthusiasm I've seen about this device than any prosthetic development over the 23 years I've been doing this," says Gitelis, who heads the limb-preservation department at Rush-Presbyterian-St. Luke's Medical Center in Chicago. It won't completely end Domonique's trips to the operating room; she'll one day need a bigger replacement. But to her mother, who spotted mention of Repiphysis during a late-night, last-ditch Internet search, that's a small price. "Think if I'd not gone on the computer," says Patton from her Battle Creek, Mich., home, where Domonique is finishing post-surgery chemotherapy. Domonique "still questions it: 'Do I have a bone in there?' She calls it a new leg." Bone cancer is rare, with only about 1,900 U.S. cases each year. But it is most common in children and young adults, where it usually strikes near the knee. With surgery and chemotherapy, 70 percent are cured. Amputation once was the only hope. Then surgeons devised ways to cut out the leg tumor and bridge the 6- to 8-inch gap with metal rods, reconnecting thigh and shin bones, new knee included. That worked for adults, but children were still growing — and cutting out the tumor also removed the thigh's growth plate, leaving a salvaged leg painfully shorter than their healthy one. So next came expandable rods: Surgeons could reopen the leg to periodically add a longer length, or, with minimally invasive versions, slice a small hole in the leg and turn a screw to slide out an extension. Suddenly, 8- to 10-year-olds were having their legs saved. But the younger the patient, the more surgeries they'd need — which is why very young children usually get amputations, Gitelis explains. Enter the Repiphysis, invented in France in the late 1990s and quietly approved by the Food and Drug Administration for U.S. sale in December. Consider a toilet-paper holder: A spring inside adjusts two overlapping ends to the right length. Repiphysis has a similar spring, held by a polymer sleeve hooked to an antenna. Beam harmless electromagnetic rays at the leg and the antenna heats, softening the polymer sleeve until the spring loosens — and the rods' ends slowly extend. Turn off the beam and in seconds the polymer hardens, freezing the rod at its new length. The rod expands a few millimeters at a time, so surrounding skin and muscle aren't damaged and can grow to match. It's done in the doctor's office, no sedation required. Manufacturer Wright Medical Group of Arlington, Tenn., customizes the $20,000 to $30,000 implant to fit each patient — 40 to date. Most are for preteens hoping to avoid at least three additional surgeries they'd need with standard limb-salvage devices, says Brian McDaniel, Wright's custom orthopedics chief. The work normally takes five weeks, done during pre-surgery chemotherapy — Domonique's was a special rush job. It's not for everyone — standard limb-lengtheners do work well, particularly for teens, and patients will need an adult-sized replacement when they finish growing. But Wright says 25 of the nation's 100 orthopedic oncologists have begun offering Repiphysis to their youngest patients.